In years gone by, power supplies for chassis switches were notoriously complicated. Some work with 110V only, some with 240V. Couldn’t be combined with other power supplies – all models identical. This led to lots of piles of spare power supplies in the corner of the data centre somewhere hoping they could be reused one day. So it’s refreshing to see the flexibility of the power supplies for the Nexus 7000. 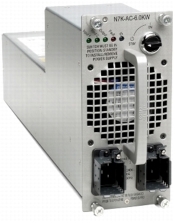 Mixed combinations of the 6.0kW and 7.5kW power supplies is supported. The power redundancy modes are designed to determine the optimum power for the combination of power supplies installed, helping ensure system availability. The 6.0kW power supply supports operation with 110 and 220V inputs on either or both of the two inputs, which results in different levels of output power for the different redundancy modes. * I also note that each power has a dual power connector that can be connected to the A and B power supplies for EACH power supply. * Provide redundancy within the power supply unit; if one input fails, power is still drawn from the other input – nice. * how swappable (obviously you need to have some spare power but still good). * real time power draw from the power supply (not extrapolated from the supervisor). Adds up to good flexibility and better matching to a modern power practices in the data. Especially the dual input per supply. Also there is an option for DC power! I have been comparing the Nexus power and fabric upgrades similar to what the Drobo pioneered for NAS devices. If you want more capacity (disk space, fabric bandwidth, power) simply buy a new component and plug it in! The system automatically takes advantage of the new hardware. Is this a valid comparison? I did a RMA one year ago on a whole N7K Chassis because 3 PS failed at the same time … I think I still got picture of them I ll give them to u … Usefull stuff when you are doing a BBQ with the family …………..